Maïmouna Guerresi, an Italian-born artist who converted to Islam and joined the Murid Muslim community in Senegal, Africa, explores cultural diversity, Islamic spirituality and mysticism, and the roots between mother and child in her striking sculptural and photographic work. Explore some of her powerful work, and learn more about her in her interview with Muslima curator Samina Ali. Adji Baifall Minaret, 2004, Lambda print, 200x90 cm. Her large colorful mantle, which I made with the help of other Sufi African women, consists of 99 individual pieces of hand-sewn fabric, representing the 99 names of God. Maïmouna Family (Mother of Two Cultures), 2006, Lambda print, 150x100 cm. This picture is part of a series of works where I analyze a possible unifying relationship between two cultures and religions, represented by my own two daughters. I am in the center representing their maternal union. Mother Minaret, 2010, Lambda print, 200x125 cm. A very tall, veiled figure resembling a minaret, which I actually designed as the original background for this piece. Samina Ali: You are a sculptor, video artist, and a photographer. I can see your various talents influencing your photographs, which look like haunting paintings. In fact, I’ve heard you described as the Sufi Frida Kahlo. What is the inspiration behind your work? I’m glad to be considered a Sufi Frida Kahlo! Frida was a great woman and artist, and although life was cruel she was able to transform her suffering into art of the highest quality. My moods are expressed in my work as faces, color, and emotions, where the body is no longer a prison of the soul, but rather like a temple to house and augment the Divine. In my work I use different techniques from video to sculpture to photography, because I think that every artwork has its own identity and can be expressed more effectively in one technique than another. The slideshow that’s part of our exhibition is showing images of mystical figures from Islamic Africa. Your own multi-ethnic family posed in robes that are sculptures you created. Tell us a little bit about these robes. The veiled figures that are in my work symbolize the body as a sacred building, as the “temple of the soul,” according to a style reminiscent of some traditional Madonnas of classical art. The costumes are made of fabrics that I collected in my travels in Africa or Asia. Sometimes these costumes are made directly on site, as in the picture “Adji Baifall Minaret,” which includes a large colored coat that I made with the help of other Sufi African women. The coat consists of 99 individual pieces of hand-sewn fabric, representing the 99 names of God. The people who pose for me are part of my multi-ethnic family or friends, so I already have relationships with them based on empathy, collaboration, and confidence. When I photograph them they lose their individuality, becoming spiritual symbols that meld with my spirit. I’ve read a New York Times interview with you where you describe your photographs as not being “about people or facts but representing infinity and cosmic space.” Can you explain what you mean? I like to think that a body may be changing fast, like in the blink of an eye. For example, the work “Cosmo” was born from this concept. I created a piece that represents a feminine image, seen from above, which spins and becomes many planets in the cosmic space. Many may not know this, but you were raised Catholic in Italy. You converted to Islam after encountering an African Sufi community in Senegal. What specifically drew you to Islam? I was born in a religious family, especially my mother’s side, so I had an uncle who was an Africa missionary and an aunt who was a nun. At home we often had religious guests from Africa. So for me there was a certain familiarity with the African people. Then I was introduced to a Muslim Africa, thanks to my husband Sherif Assane who introduced me to the Muslim Murid community. The Islamic faith has fascinated me, in particular for the extraordinary inner strength it teaches. It’s probably something that can be said of all religions, but apparently at that time Islam was my way. It is a faith that has helped me, and still helps me, understand many questions. When I see your work, I see so much Sufi influence. Did you work and vision change after your conversion? Islamic art and literature is full of mystical concepts, metaphors, knowledge, collected poems, verses, of miraculous and sacred value, and for me this is an endless source of inspiration. We are seeing some visually arresting photos of mothers and daughters. What is the best lesson or advice your mother gave to you that you’d like to pass down now to the next generation of women? To take care of themselves, to be curious and receptive, to maintain their spiritual integrity, to expand their spiritual knowledge through reading and religious practice. Women have a great task to improve society. Maïmouna Guerresi is a photographer, sculptor, and video and installation artist. She lives and works in Verona and Milan, Italy, and regularly travels to Dakar, Senegal. Her early works were inspired by the European Body Art movement of the 1960s and 70s. She soon developed her own very personal style, which combines Afro-Asian themes and symbolism with the traditions of Western classical iconography. Through this hybrid visual language she communicates the discomfort and beauty of cultural diversity and contemporary multiracial issues. Her photographic work often depicts the mystical figures of Islamic Africa. In 1991 Maïmouna traveled to various African countries and converted to Islam in Senegal. This marked her new identity and another direction for her work. 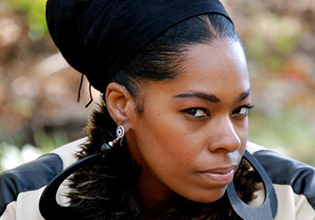 She adopted the name Maïmouna, referring to the recurrent themes of multiculturalism and feminine spirituality. Learn more at www.maimounaguerresi.com. 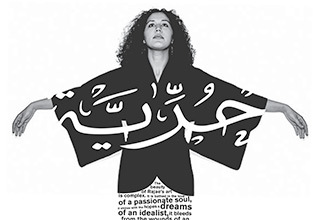 This interview was originally conducted as part of Muslima: Muslim Women’s Art and Voices here. 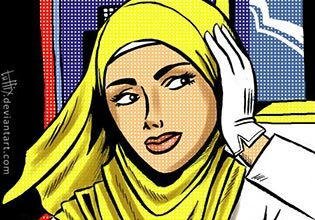 Where are all the Muslim women in music and pop culture? Singer and artist Rajae el Mouhandiz is breaking down walls every day.